The UK bank is under pressure to boost capital by selling Citizens. Losing its earnings would make it harder to resume dividends, and in turn hinder the state selling its stake. 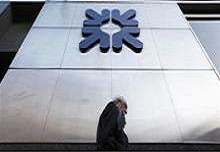 But with the euro zone crisis not definitely over, an overcapitalised RBS may be the lesser evil. Royal Bank of Scotland reported underlying pre-tax profit of 1 billion pounds for the three months to end-September, up from a 2 million pre-tax profit over the same period last year. It made a statutory post-tax loss of 1.4 billion pounds in the third quarter, distorted by an accounting quirk that requires banks to record losses when their credit positions improve. The loss included a 400 million pound charge relating to claims for mis-sold Payment Protection Insurance. While revenue for the first nine months of this year was down 4 percent to 19.7 billion pounds, underlying pre-tax profit rose 46 percent. Operating profit was highest in RBS’s UK retail unit, which made 464 million pounds over the third quarter. UK corporate business fell off sharply quarter-on-quarter, although RBS’s Markets division swung to an operating profit of 295 million, from a loss of 348 million over the same 2011 period. The group’s Basel 2.5 Tier 1 ratio was 11.1 percent for the first nine months of the year. RBS reiterated its intention to achieve a fully implemented Basel III capital ratio of 9.0-9.5 percent by December 2013, against about 7.5 percent now. Excluding the benefit of the government’s Asset Protection Scheme, which RBS exited last month, the group’s risk-weighted assets stand at 481 billion pounds and its core Tier 1 ratio is 10.4 percent. However, the RWAs could rise under Basel III. Jim O’Neill, chief executive of UK Financial Investments, which oversees the government’s RBS stake, told the parliamentary commission on banking standards he had discussed strategic options with the bank including the sale of Citizens, Reuters reported on Oct. 23. Andrew Bailey, managing director of the Financial Services Authority, has also written to RBS to recommend that the bank look at selling its U.S. arm, Sky News reported on Oct. 16. RBS chief executive Stephen Hester told journalists on Nov. 2 that Citizens remained part of his core strategy, but added that there might be a day when a sale of the U.S. business could help shareholder value. By 1130 GMT on Nov. 2, RBS shares were trading at 281 pence, down 2.1 percent.